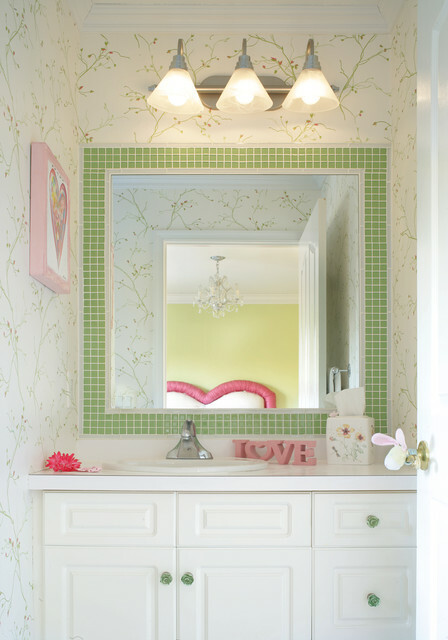 With minimal expense, the soft green and pink wallpaper and green glass tile framing the mirror coordinate with the adjoining bedroom's color scheme.The green glass floral cabinet knobs add yet another touch of femininity to this ensuite bathroom. wallpaper? - what is the name/brand of the wall paper used? The wallpaper is from York Wallcoverings. Mirror - How is the mirror made? Are the 1x1 tiles mounted on something? How is the mirror mounted? Wallpaper - Where could I find that wallpaper? It is beautiful! Do you have the Name of pattern and manufacturer or book it came from? I love the tile around the mirror!